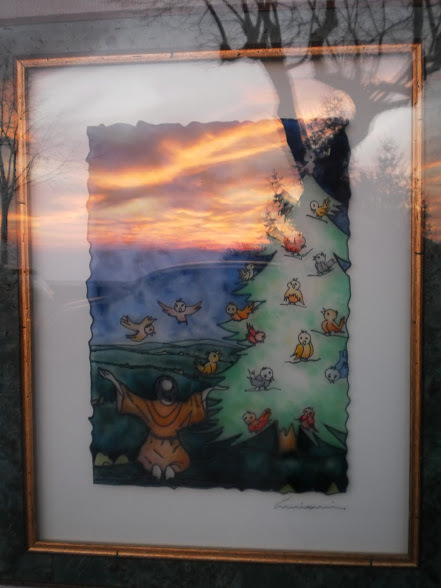 Francis of Assisi is often depicted as a lover of animals and nature, an innocent figure of child-like enthusiasms at stark odds with the credos of a spiritual revolutionary. He became the model for first card I created, signifying, above all else, the renunciation of the world in order to love the World. It was in the Sacred Valley north of Rome, while walking in the footsteps of Francis of Assisi, that I first became immersed in the iconography and history of Francis. With the winter sun casting pale light through dense fog and the bare limbs of deciduous trees, it was easy to transport my imagination back to the temperament of his time. By no means do I intend this to be a definitive account of Francis; rather, these are some of the personal reflections from that pilgrimage that inform the many readings of this eccentric saint, whose spirit I encountered in the lush amphitheater unofficially named the Sacred Valley in his honor. 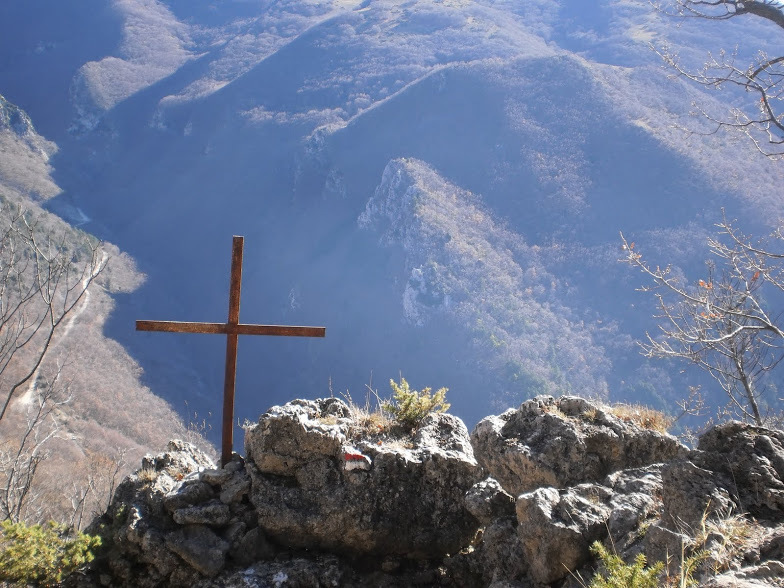 The Cammino di Francesco is a circular route beginning and ending at Rieti, a small city 50 miles north of Rome. Following the gentle current of the Velino River towards Greccio, the pilgrimage leads up a forested mountain populated with centuries-old oaks to the sanctuary of Fonte Colombo. Here, in 1223, Francis revised the famous final rule that brought instutionalized order to his burgeoning band of brothers and earned the papal seal. It was also at the sanctuary of Fonte Colombo where he had his growing blindness “treated” two years later with the application of white-hot irons to his temples. He reportedly implored “brother fire” to be gentle with him during the cauterization. This is the same Francis who penned the Canticle to Brother Sun and Sister Moon. Centuries later, his pantheistic language and social activism helped remake Francis into the image of an eco-centric missionary; however, he was deeply traditional, inspired by the literal example of Christ and needing only a few simple gospel verses to inform his original ‘primitive rule’ and its practice of poverty, humility and fraternity. Indeed, Francis only reluctantly revised the regula primitiva due to the clamor for more order, structure and – one may argue – dogma, as his fraternity expanded in number. 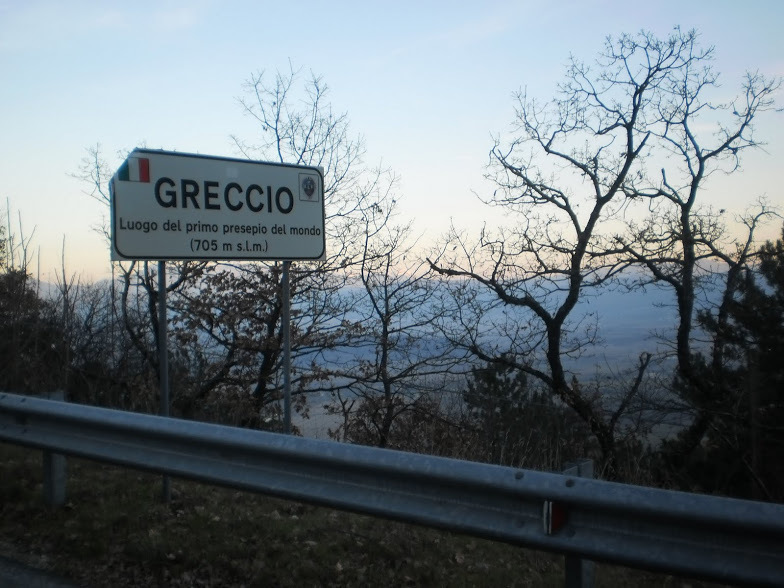 The day ended following a steep ascent to Greccio, marked by a huge dog-eared road sign outside the crash barrier at 2300 feet declaring it the “Place of the world’s first manger”. Francis created the first nativity scene at the nearby hermitage, consequently gifting Greccio the moniker The New Bethlehem; just as Fonte Colombo had been dubbed the Franciscan Sinai in a nod to God’s role in dictating his rule to Francis during a 40-day retreat. Francis had a special affection for the baby Jesus and the creation of a nativity scene bypassed heady theology for a direct engagement with the rugged simplicity of Christ’s beginnings. Caravaggio’s Nativity with San Lorenzo and Francisco d’Assisi depicts a rare kind of nativity scene: one stripped of romantic embellishments. 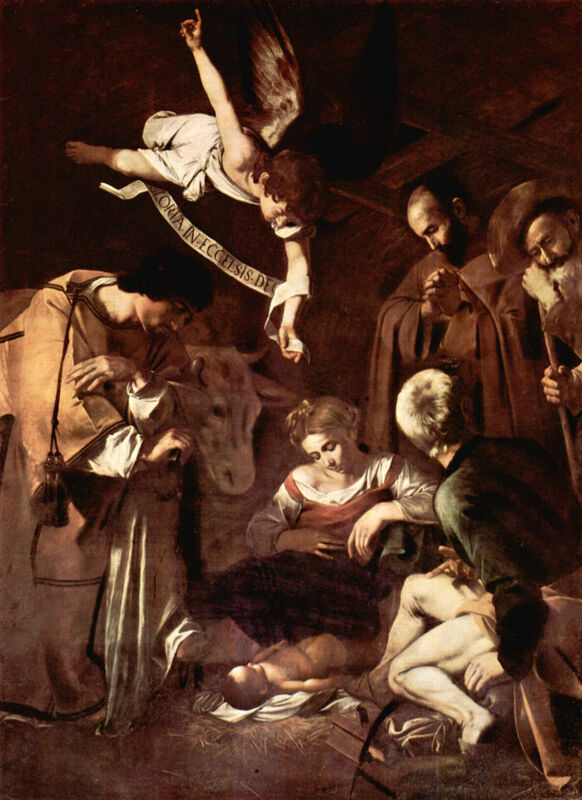 Art writer for The Guardian Jonathan Jones described Caravaggio’s Bethlehem manger as a “dank, dark hovel” rendered in “earthen, worn-out brown”; it was, Jones wrote, “one of the most eerily lifelike and grimly imagined of all artistic attempts to conceive the birth of Christ in a stable”. In a curious post-script, the painting, measuring nearly 65 square feet, was crudely cut out of its frame from the Oratorio di San Lorenzo, next to the Basilica of San Francesco in Palermo, on October 18, 1969. It remains one of history’s great art heists. 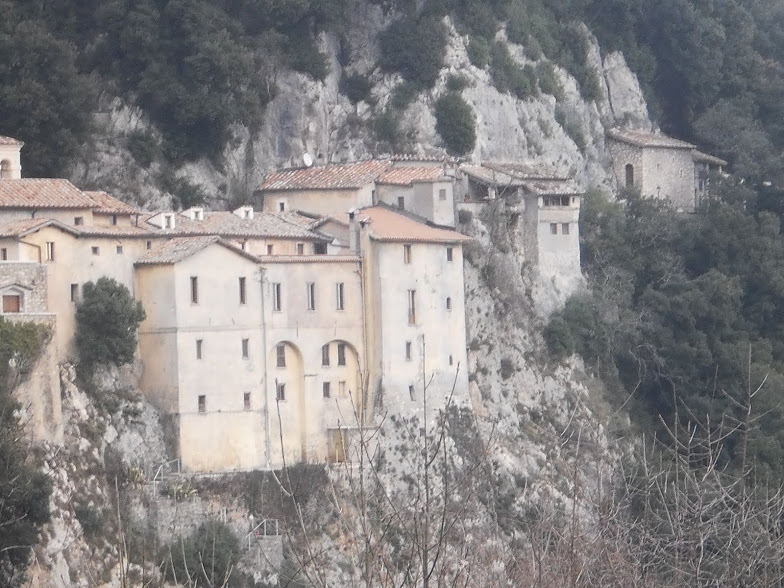 As I scaled the final few hundred feet to Greccio, I saw the medieval village as a cluster of incongruent buildings sitting atop Mount Lacerone like a hastily assembled crow’s nest. This medieval hill community was in turn dominated by another dramatic vertical thrust overlooking the piazza: the bell tower attached to the Church of Saint Michael the Archangel. And there mounted and free-standing, grafted onto the cross but otherwise suspended in mid-air, was the crucified Jesus. 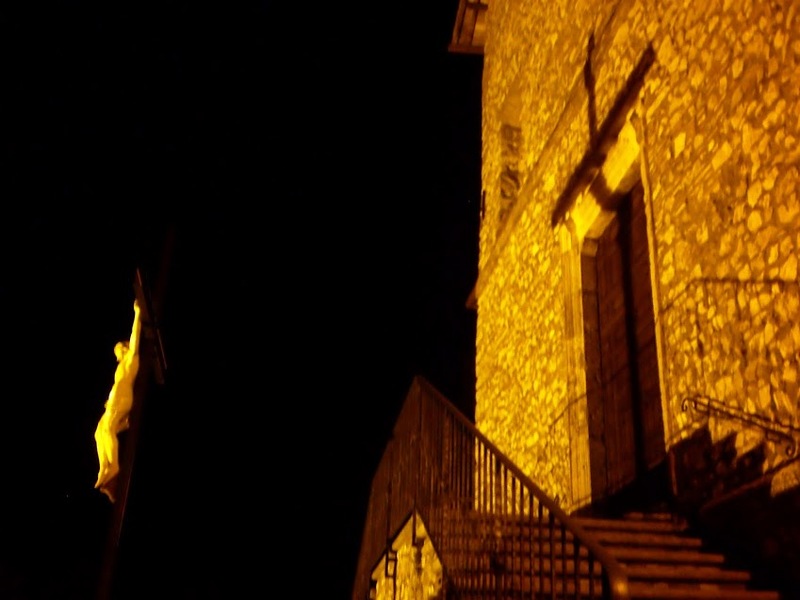 Because the church was part of the old castle of Greccio, which rose above the piazza, and the crucified Jesus was poised above the front wall and out from the bulk of the building, his alabaster body – back-lit by dim, coppery lights – shone like a raised beacon. This Jesus evoked Salvador Dali’s Christ of Saint John of the Cross. The Spanish surrealist depicted Christ from above, floating in the night sky over a body of water. Dali had deliberately eschewed nails, blood and a crown of thorns; his face was obscured, so we weren’t to know if this Jesus was in agony or king of the world. The first biographer of Francis and a saint in his own right, Bonaventure of Bagnoregio, called reality a “coincidence of opposites”. The cross symbolized the tension of this coincidence, and Jesus was right in the middle of it – the mediator between heaven and earth, between divinity and humanity; suspended between a good thief and bad thief, a male body with a feminine soul (as described by Franciscan author Richard Rohr). Maybe this was why Dali’s Christ looked so regal: the painter said he was inspired by a dream in which Jesus was the nucleus of the atom. He was holding together the dualistic tensions of the entire world. It brought to mind the so-called Simple Prayer of St Francis and its cadence of opposites. Originally published in France in 1913, this widely known and adapted prayer became inextricably associated with Francis – that is, Francis the human agent of reconciliation. From the Greccio hermitage (above), a thinly veiled opening in the sky had allowed redeeming strokes of sunlight to filter through the fog and the gunpowder grey of the clouds, and into isolated spots in the valley below; a rolling tapestry of light shifts and gradations. 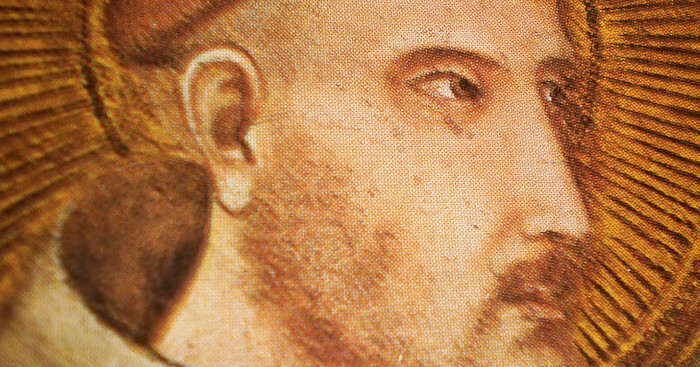 I was now heading for Poggio Bustone on the other side of the valley, where Francis was said to have taken refuge after publicly renouncing his earthly father, and the world of war profiteering and cloth trading that he was trying to bequeath Francis. After a public trial, Francis had stripped naked in the town square and handed back not only his clothes but his very identity as his father’s son. 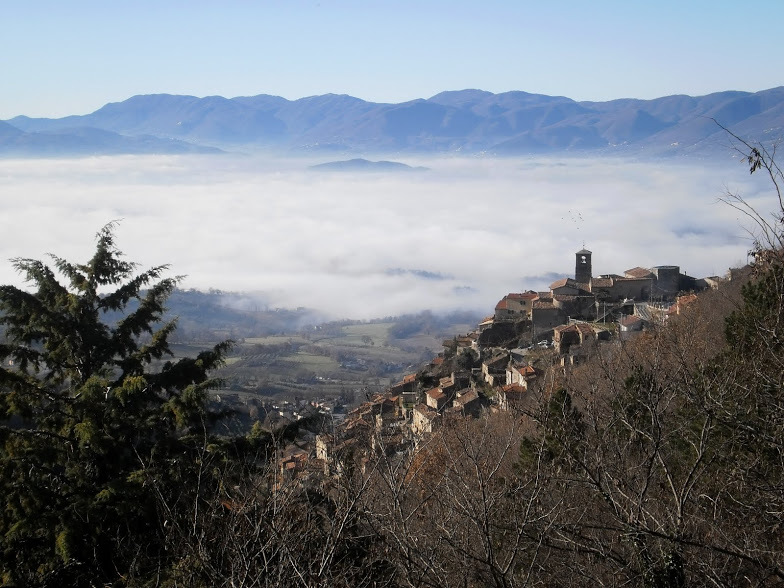 The ascent to the vertiginous town of Poggio Bustone was richly rewarded. How this eccentric place fit itself to the rough contours of Monte Rosato defied belief. Poggio was a rabbit warren of concrete and scrubbed brick that required abrupt 180-degree turns through shadowy archways, short tunnels and landings to manage the steepness of the rise. There was no uniformity to the staircases, and they obeyed some ad-hoc rule of quirky coherence. The parallel streets were aligned in tiers, and the whole effect on the visitor was of an enchanted half-real world. At the main thoroughfare, over a cantilevered edge, the vista took in a massive sweep of the valley and oversaw a tide of cottony mist filling the lowland. 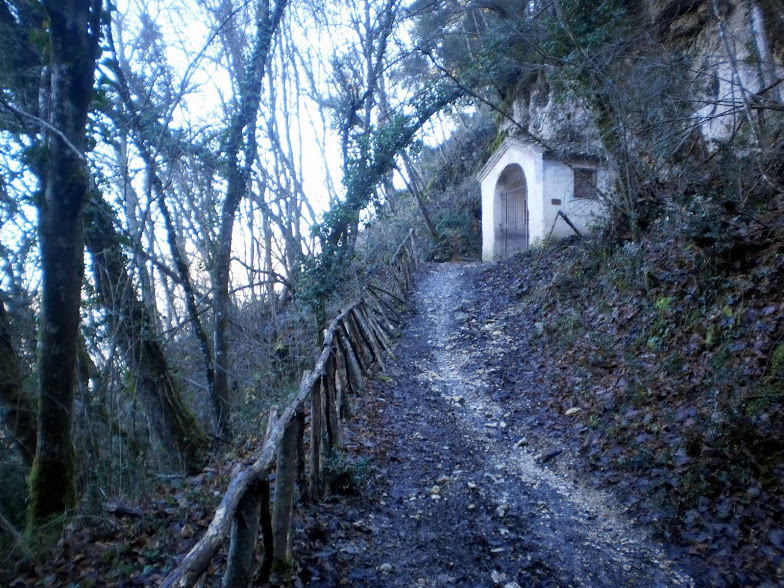 The following morning I climbed even higher and further around the lower mountain, to the sanctuary of Poggio Bustone, which was, according to legend, donated to the Franciscan Lesser Brothers in 1217 and well situated to preach to passing shepherds. Viewed from the decking of the lower hermitage, the visible edge of Poggio was now remote and distinct, its terracotta-colored roofs tapering to the spire of a crown: the bell tower of the local church. The location shared a kinship of dominance with the range on the opposite side of the amphitheater, and I was literally above the cares of the world. Two iron crosses perched in the higher reaches of the mountain, surrounded by holm oaks, maples and hornbeams, caught my attention and imagination, however, and I found the path leading to the sacred cave where Francis was said to have received remission from his sins from Archangel Gabriel. The first sighting of the cross triggered a sudden burst of euphoria, and then, all within the space of a few seconds, I was bent over double with an emotion for which I could give no plausible explanation. A wave of convulsive sobs rose through me. I was overwhelmed with relief and gratitude in this canopied field of dirt, rock and tree. I leant into the earth and the trees, and the very ground returned the warmth and kindness of an embrace. Mentally I sought to understand what was happening but soon gave up, realizing such a vain pursuit was antithetical. The symbol of the cross and Francis’s love of the natural world had converged into a direct experience of something both otherworldly and yet centred in the Earth herself. I had tried to conceptualize Francis and yet still commune with his spirit and the tension between these two opposites gave rise to a third reconciling force; one felt simply as radical love. Radical in its unexpectedness, radical in its groundedness. If this was a facsimile of mystical union, unearned, then it was typically Francis: deeply embedded in, not divorced from, the world. It seems fitting that Francis bore the stigmata later in life. The physicality of his chosen path etched into his palms; the symbol made flesh. He seemed to rewrite our understanding of renunciation not as a withdrawal from the world but a radical engagement with it, freed from social mores to love passionately, unconditionally, without recourse to a narrow identity. Francis ought to be a countercultural icon. He kissed lepers, gave away his inheritance and property, rebuilt the church with his bare hands, and commanded the near impossible: to fulfill Christ’s example and banish all barriers to love. He even crossed the Egyptian battle front during the Fifth Crusade to try and engineer peace with the Muslims. Francis’s spirituality of poverty, simplicity and renunciation was a rejoinder to the greed and unequal distribution of wealth that was as relevant then in Assisi as it is today in our world. Clearly, Francis was a man of his convictions. In that proper context, his loving declarations to the natural world aren’t sentimental but an all-encompassing embrace. The gospels to Francis were proof of the living spirit of Christ, the animating force of the Holy Spirit and the natural world as expression of God’s abundance. He somehow managed to both work within the institutional framework of the Catholic Church and still act as a radicalizing influence –following his conscience regardless of where it took him. Though Francis landed on the right side of history, he could just have easily been excommunicated as beatified. Franciscan friar and author Richard Rohr writes that the symbol of the cross represents a cruciform pattern to reality. “The people who hold the contradictions –and resolve them in themselves – are the saviors of the world. They are the agents of transformation, reconciliation, and newness.” The second stanza of A Simple Prayer remains one of my favorite verses, and a testament to unity and the fulfillment of love as the ground of reconcilation.